A University of Toronto researcher is among a global group of experts who have demonstrated, in principle, a device that could serve as the backbone of a quantum internet. Hoi-Kwong Lo, a professor in the department of electrical and computer engineering in the Faculty of Applied Science & Engineering, and his collaborators have developed a prototype for a key element of all-photonic quantum repeaters, a critical step in long-distance quantum communication. 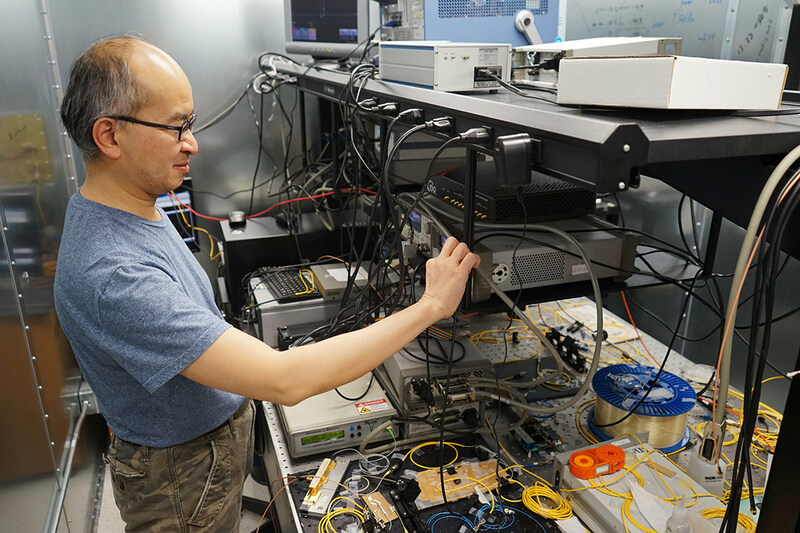 “An all-optical network is a promising form of infrastructure for fast and energy-efficient communication that is required for a future quantum internet,” says Lo, who is cross-appointed to the department of physics in the Faculty of Arts & Science. A quantum internet is considered the Holy Grail of quantum information processing, enabling many novel applications including information-theoretic secure communication. By contrast, today’s internet was not specifically designed for security, and it shows: breaches, break-ins and computer espionage are common challenges. Nefarious hackers are constantly poking holes in sophisticated layers of defence erected by individuals, corporations and governments. In light of this, researchers have proposed other ways of transmitting data that would leverage key features of quantum physics to provide virtually unbreakable encryption. One of the most promising technologies involves a technique known as quantum key distribution, or QKD. QKD exploits the fact that the simple act of sensing or measuring the state of a quantum system disturbs that system. Because of this, eavesdropping by a third party would leave behind a detectable trace, and the communication could be aborted before sensitive information is lost. Until now, this type of quantum security has been only demonstrated in small-scale systems. Lo and his team are among a group of global researchers who are laying the groundwork for a future quantum internet by addressing some of the challenges of transmitting quantum information over great distances using optical fibre communication. Because light signals lose potency as they travel long distances through fibre-optic cables, devices called repeaters are inserted at regular intervals along the line. The repeaters boost and amplify the signals to help transmit the information. But existing repeaters for quantum information are highly problematic. They require storage of the quantum state at the repeater sites, making the repeaters error prone, difficult to build, and very expensive because they often operate at cryogenic temperatures. “We have developed all-photonic repeaters that allow time-reversed adaptive Bell measurement,” says Lo. A quantum Internet could offer applications that are impossible to implement in the conventional Internet, such as impenetrable security and quantum teleportation, which takes advantage of the phenomenon of quantum entanglement to transmit information between atoms separated by large distances. “Our work helps pave the way toward this future,” Lo says. The research was funded by the Natural Sciences and Engineering Research Council of Canada, among others.